Burns and scalds need to be treated quickly and effectively so that the victim receives as little damage as possible. 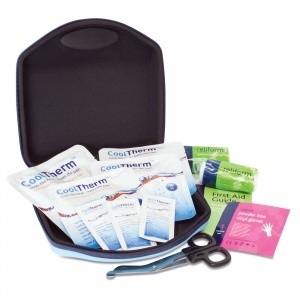 The CoolTherm Professional First Aid Kit for Burns provides all the materials you need to carefully treat burns, and is ideal for areas where there is a higher risk of burns occurring, such as kitchens. With the emergency professional in mind, the CoolTherm First Aid Kit has been purposefully designed to quickly respond to burn injuries. A simple guide to basic first aid is also included in the case should guidance be needed for certain products. 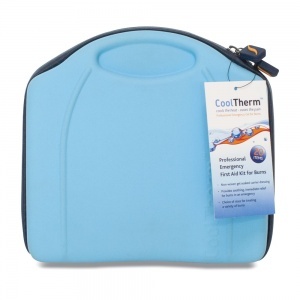 What Is Included in the CoolTherm Burns Kit? The case itself is moulded from ethylene-vinyl acetate (EVA) material with combined softness and flexibility, but remains incredibly durable and waterproof so that all the contents inside are protected. The compact case is easily identifiable in an emergency and is resistant to cracking under stress, even at low temperatures. The CoolTherm Professional First Aid Kit for Burns is usually dispatched via First Class Royal Mail and delivery should be within 1 to 3 working days.